Taking singing lessons with Jeannie is so much fun! She's amazing, very sweet and the most helpful teacher I've ever had! She lets me know exactly what I need to do to work on improving my voice. We have great conversations together and I always look forward to our lessons every week! I highly recommended her if you're looking for a singing teacher! Jeannie, you're the best! When I found Jeannie she was legitimately a light at the end of the tunnel. Since a young age I have suffered from clinical depression. Singing has always seemed to be the one thing that would get me through my rough patches. Initially I joined singing lessons because I just wanted to start incorporating singing into my normal routine as a type of coping skill for me. I also had hopes of being able to build up more confidence to sing in public, rather than just (I'll admit it) in my room or the shower (ha ha)!! My very first lesson, despite how warm and inviting of a person she is, I was shaking, sweating and could hardly look her in the eye I was so nervous. Last week, after faithfully attending more of my lessons, I recorded a CD. I had someone sit in during my lesson where I stood holding the mic and was just going for it. I truly have been able to open up more, socially, and my days are a bit brighter. I look forward to the day where I may comfortably and confidently share my voice with a wider audience. I look forward to many memories with a great teacher and a lifelong friend. Last winter my mom signed me up for voice lessons. I have to admit I was a bit nervous, but knew I wanted to try it. I am so glad I did!! It has been really fun and I just sang in my first recital in May 2014. 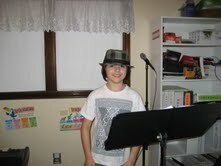 It was cool performing with a real microphone in front of my family and friends!! Jeannie is talented and sweet and you should hear her voice; Amazing! I hope I can sing like her one day." 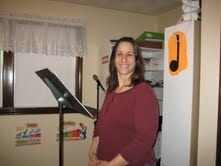 "When I first started taken Voice Lessons I figured it would only be for a few years. I always knew that I had a nice voice and this way I would be able to see if I could develop it. Little did I know that I would love it so much that I am just finishing up my 10th year taking lessons. It has been a wonderful experience." "My daughter was a shy 10 year old with a beautiful voice. Three years later she is a confident 12 year old who loves to sing. Jeannie is actually pretty far from us (30 minutes each way - sometimes longer with traffic). We could definitely find someone closer, but never will. Not only is Jeannie a great teacher she is one of the kindest people I have ever met. Her students mean everything to her. She is unbelievably humble and modest, I almost died at the first recital when she sang a song. It was "I Dreamed a Dream," the song Susan Boyle sang on Britain's Got Talent. I'm pretty sure I cried. She is amazing." "Singing with Jeannie is AMAZING! I started taking lessons with Jeannie even before she started her own business; that was almost 10 years ago! I wouldn't want anyone else to train me. Jeannie is a one of a kind person that is VERY good at what she does. I'd recommend her to any teen or adult that wants to sing. Trust me, you WON'T be disappointed. What else can I say? I LOVE MISS JEANNIE." "A large part of singing, as with any performance art, is being confident in your abilities and brave enough to try. Jeannie knows exactly how to support you and bring you to those places. When I talk about Jeannie to someone who doesn't know her, I always say, "If I wasn't paying her as my voice teacher, I'd hire her as my psychologist." I'm actually only half joking. Jeannie is the single most accepting, honest, intelligent individual I have ever had the pleasure if knowing. She has been my vocal coach for just about 9 years. So, I feel qualified to say that she knows exactly what she's doing musically, and is one of the greatest teachers and friend anyone would be lucky enough to find." "Even though I've been taking lessons for 1 year, I LOVE it ! It's so much fun and I've learned a lot. Also, Miss Jeannie is so nice. I highly recommend starting singing with Jeannie."